Giddy 3 is a retro-tastic platform puzzle game! Featuring bright colourful graphics, smooth scrolling, puzzles, and an egg with unfeasibly large hands! 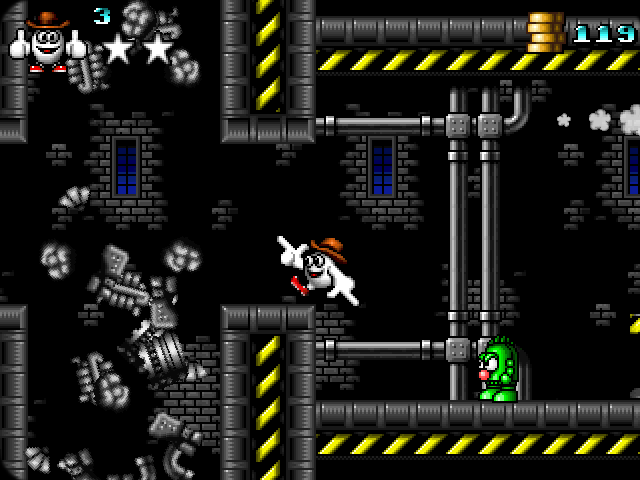 Set across 5 large scrolling levels, you play the part of Giddy, the all-round good egg, who has to save the world from aliens, intent on taking over the world with giant robot stompers! Giddy 3 supports the iCade! Just pair the iCade with your webOS device, then turn on iCade support in the options menu. Note that while the game is playable on the Veer, the controls are a bit fiddly and the text is small on the small screen, but it is playable, so I have now added Veer to the supported devices. However, if you have very large thumbs, or poor eyesight, you might have difficulty playing it on the Veer.